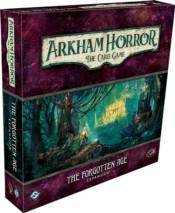 Join the expedition in The Forgotten Age deluxe expansion for Arkham Horror: The Card Game! Five new investigators explore dark rainforests and forbidden caverns in search of an ancient Aztec temple, but the truths they uncover could undo our entire understanding of the universe. Will you make the discovery of the lifetime, or will you become lost in time?